Do you remember the statement “You’ll be soon able to configure your own zones.“? “Soon” took a little longer in this case, but finally: Here it is! Which zones can I configure? You can now configure heart rate, pace and power zones for every sport. (For power, you still need to activate the power checkbox in the sport’s configuration.) If you don’t want to configure zones for every sport you can also define default zones for each of the metrics. For pace zones, we also have extra default zones for running, swimming and cycling, which also take precedence over user-defined default zones. From our point of view it make sense that swimming and cycling in particular should not have the same pace zones. 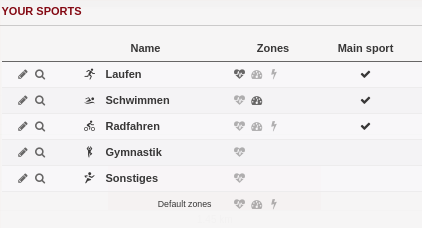 In this case, heart rate zones for ‘Laufen’ and pace zones for ‘Schwimmen’ have been configured. Where is the zone configuration available? Your configured zones are available in the activity view and analysis tab. The zones are not marked in the respective graphs. This should be the case later, when we have revised the activity overview. Please remember that in the “analysis” tab only the average data fields of your activities are considered. Power data got its own section in the activity view (this section will be extended little by little).